The District programs are administered by a board of commissioners consisting of three members elected in the general election and two members appointed by the South Carolina Department of Natural Resources. The District is assisted by a District Coordinator and technical staff assigned to the Chester District by the South Carolina Department of Natural Resources and the USDA-Natural Resources Conservation Service. The Chester Soil and Water Conservation District meets at 9:30 A.M. on the third Tuesday of each month in the Conference Room of the USDA Building at 744 Wilson Street in Chester, South Carolina. All programs and services of the Chester Soil and Water Conservation District are offered on a nondiscriminatory basis without regard to race, color, age, gender, national origin, religion, handicap, or marital status. 2016 CONSERVATION TEACHER OF THE YEAR IS GWYN T. CLONINGER. Our Conservation Friends are very important to us and help us continue the important task of preservinig our natural environment for future generations. We thank you who have generously donated in the past and hope you will encourage others to become involved in caring for Chester County and our natural resources of soil, air, water, plants, and animals. DR. ROBERT E. SHANNON, JR.
CONSERVATION TILLING, ALSO KNOWN AS NO-TILL FARMING, IS A WAY OF GROWING CROPS FROM YEAR TO YEAR WITHOUT DISTURBING THE SOIL CONVENTIONAL TILLAGE AGITATES THE SOIL USUALLY WITH TRACTOR-DRAWN IMPLEMENTS. THIS CAN LEAD TO UNFAVORABLE EFFECTS, LIKE SOIL COMPACTION, LOSS OF ORGANIC MATTER, DEGRADATION OF SOIL AGGREGATES, DEATH OR DISRUPTION OF SOIL MICROBES, ARTHROPODS, AND EARTHWORMS, AND SOIL EROSION WHERE TOPSOIL IS BLOWN OR WASHED AWAY. IN NO-TILL FARMING THE SOIL IS LEFT INTACT AND CROP RESIDUE IS LEFT ON THE FIELD, THUS AVOIDING THOSE UNFAVORABLE EFFECTS. SOME ADVANTAGES OF CONSERVATION TILLAGE ARE: TIME SAVINGS, EASIER PLANTING, MORE SOIL MOISTURE, BETTER SOIL TILTH, LESS EROSION, REDUCED LABOR AND FUEL NEEDS. 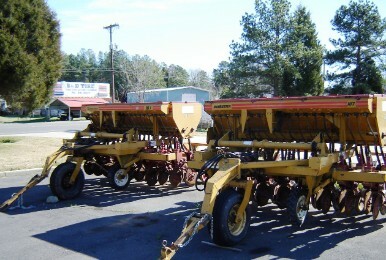 YOU MAY RENT A NO-TILL DRILL FROM THE DISTRICT FOR $10.00 PER ACRE. 2016 ROBBIE BANKS CONSERVATIONIST OF THE YEAR IS DANNY L. ARCHIE. Each year the Chester Soil and Water Conservation District and its Board of Commissioners sponsor the Allen L. Beer Scholarship for a Chester County High School senior who plans to enter college majoring in an agricultural or environmental related field. Due to a generous grant from OMNOVA Solutions, Inc., this year the board was able to award two scholarships. One $500 scholarship was presented by Allen L. Beer to Liza Wilson, a senior at Westminster Catawba Christian School. Wilson is the daughter of Joey and Sanna Wilson and plans to enter Clemson University in the fall as an agribusiness major with a minor in marketing or communications. A second $500 scholarship was presented by Mr. Beer to Jonathan Lewis, a senior at Richard Winn Academy. Lewis is the son of John and Rhonda Lewis and plans to enter Clemson University in the fall as an agribusiness major with aminor in history. The board extends its best wishes and congratulations to Liza and Jonathan.